The trouble with waiting list initiatives is that they work. You chuck in a modest amount of money, blitz the list in evening and weekend sessions, and look! The long waits disappear. No wonder politicians love them. Defined amount of money? Tick. Quantified success? Tick. Quick results? Tick. It’s a value-for-money dream come true, and everybody’s happy. But after the back-slapping is over, it’s best not to hang around. Because as night follows day, those long waits are going to grow straight back again, and a few months later you’re going to need another waiting list initiative. Why is that? Let’s look at the two things that drive long waiting times, because waiting list initiatives offend against both of them. One driver is the size of the waiting list, and this is the most important driver in the long run. If you don’t or can’t keep up with elective demand, then the waiting list will get longer and so will waiting times. A waiting list initiative is merely a short-term catch-up, and when it is over the waiting list and waiting times immediately start growing again. The other driver is the order in which patients are treated. The waiting list initiative carefully focuses capacity on the longest-waiting patients, which is perfect for reducing waiting times quickly. But when it is over? The underlying day-to-day processes for booking patients haven’t changed, so the waiting list immediately starts slumping back to its usual shape – long tail and all. So much for the long waits disappearing. What about the modest amount of money? Well unfortunately things don’t look good there either because those evening and weekend sessions are expensive, with extra-contractual session rates and bank and agency staffing. It wouldn’t be so bad if this genuinely only happened once, but it’s an expensive way of intermittently bridging a long-term gap. If this were the Æsop’s fable, the waiting list initiative would definitely be the hare. Unfortunately at national level this particular hare has now been snoozing since about 2012. Today, the English waiting list is bigger than it was when referral-to-treatment records began. Waiting times are at 22 weeks – much longer than the 18 week target. The temptation for politicians is to give the hare a sharp nudge and have another waiting list initiative, and the Secretary of State has already talked about 18 week waits being an “early milestone”. But if we were to learn from the tortoise instead, how would we approach the problem differently? The first thing the tortoise would realise is that elective capacity only needs to exceed demand by a small amount, and the waiting list and waiting times will evaporate. The second is that we need to build this capacity into the main working week. If we can do that, the cost nationally would only be a bit over £350 million a year – just one week’s worth of the Brexit bus promise. Building this mainstream elective capacity will not be straightforward. Higher clinical priorities, such as emergency demand, need to be provided for first. And there are cultural barriers to ending the habit of waiting list initiatives, as well as practical and financial ones. Nevertheless, the tortoise has the right idea. 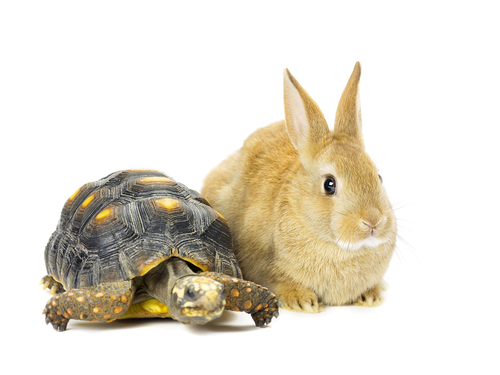 If we want to reduce waiting times sustainably and at a reasonable cost, then slow and steady is the way to do it. Indeed, that kind of stability is the whole point of having a 5 or 10 year settlement for the NHS. Isn’t it?